Alongside the iPhone 7 and iPhone 7 Plus, the Apple Watch Series 2 was a major hardware announcement at Apple's media event in San Francisco yesterday. The company pivoted slightly from the Apple Watch's original, fashion-focused unveiling, this time focusing on the internals of Series 2, and what it can do to push Apple forward in the fitness tracking category. As journalists got hands-on time with Apple Watch Series 2 after yesterday's event, a handful of impressions have surfaced online surrounding the new wearable device. Since most of its features are activity-focused (swimming, running, etc. ), opinions on how the new Apple Watch functions under these conditions were left to speculation, but otherwise the resounding takeaway appeared to be that Apple has successfully innovated in areas where Series 1 lacked, despite the fact that extended battery and a slight design change would have been welcome. 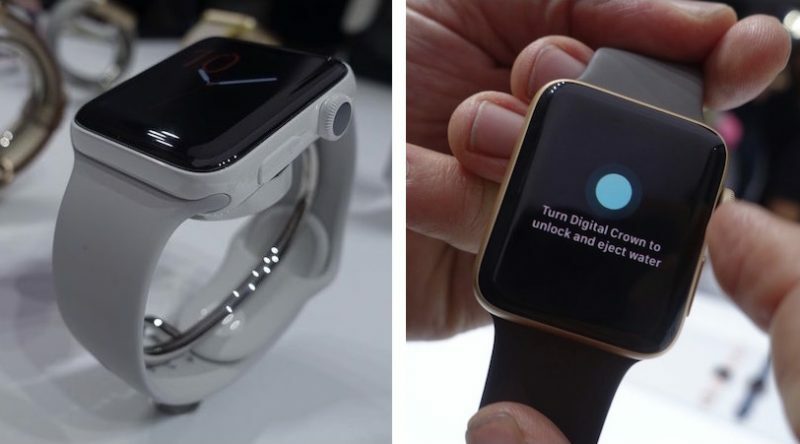 Starting off with the most expensive Ceramic Apple Watch Edition, which runs for $1249 (38mm) and $1299 (42mm), Wareable noted that the ceramic finish "felt smooth and light to the touch" and was "more attractive in real life." The case was also reflective of more light in comparison to aluminum and stainless steel, but given Series 2's ultra-bright display, it doesn't seem to be an issue. Ultimately, Wareable sees Series 2 as Apple's next step "to be taken seriously in the fitness sphere." I strapped on the new Edition, which starts at a casual $1249. Apple claims ceramic is one of the toughest materials in the world, and it felt smooth and light to the touch. It's more light-reflective than I expected, and looks more attractive in real life than from the presentation's images, if you're a fan of the gently rounded cube display and chunky straps. While Series 2 doesn't offer much for those longing for new designs, the under-the-hood changes are clear indications of Apple's desire to be taken as seriously in the fitness sphere as Garmin and Polar, while retaining its minimalist design. The Verge compared the thickness of Series 1 with Series 2, noting that Series 2 is about one millimeter thicker than Series 1, "though you really have to look closely." The site also commented on the similar battery life of each Series -- 18 hours, according to Apple -- but retained any in-depth opinions on the new Apple Watch for a future review. 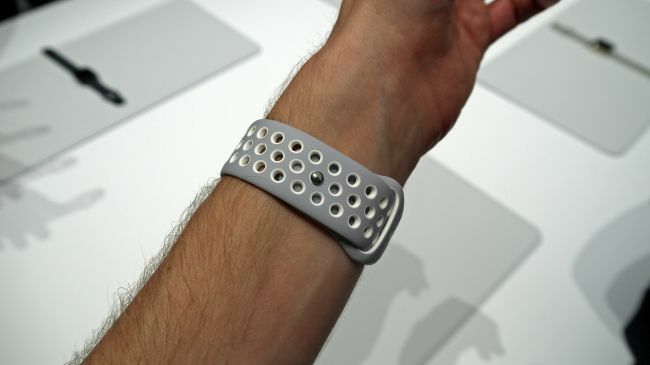 TechRadar gave one of the most detailed opinions on Series 2, commenting on the "simplicity" of the fitness-focused features in the device, which might also be its "greatest drawback." The site gives an example of the Apple Watch miscalculating the user's stroke during a swimming workout, and not being able to alter the data because the bare-bones workout app doesn't offer such a feature. TechRadar feared that "if you can't trust what you're seeing, then you'll come to disregard it as a training tool." The big question is whether these changes are enough – sure, the fitness credentials are good, and a solid upgrade, but these are the things we were hoping to see last time around, rather than having to wait two years for. But then again, the smartwatch market is incredibly turbulent, and while Apple never disclosed sales figures of its first Watch, it was certainly the best-selling device of its kind by an absolute street. The Apple Watch Series 2 builds on that success, comes with water resistance and fitness smarts and a brighter, more useful screen – but it's iterative again. Focusing on one of the cheaper collections, SlashGear took a dive into the Apple Watch Nike+ Edition, which won't launch until sometime in late October. The site called the Nike-branded Apple Watch "extremely similar" to the rest of the Sport collections, noting that "it's relatively light on the wrist." Still, given the short time in the Apple event showroom, the site is unsure whether or not the Nike branding, exclusive watch faces, and Siri commands will all be enough to pick this edition over other models. This version of the Apple Watch feels extremely similar to that of the rest of the series - especially since it's nearly identical save the Nike branding on its back and the new set of straps. It's relatively light on the wrist and the strap seems to fit well for a wide variety of wrists. Whether or not this particular version of the watch will be worth buying over the standard Apple Watch, we can't quite yet tell. We'll have to give the whole lot a try before we can give any definitive answers. Rolex started using ceramic for their bezels about a decade ago... they are virtually scratch proof but the can crack/shatter with a large enough impact. I suspect we will see some that do once the masses get them. These changes will unlock the watch for alot of people that were holding back on Gen 1, particularly the waterproofing & GPS. It'll be interesting to see how sales go because of this. I'll be getting one for the holidays just for the exercise aspect making it a replacement for my watch and fitbit. I liked the ceramic until I saw the price. $1,200 for a 42mm. Yikes! I was expecting (obviously wrongfully) in the realm of stainless. Guess I'll be grabbing a sport. Does the warranty cover water damage? Why is Apple continuing to pour excessive amounts of R&D, resources and money into a failed product called the Apple Watch? A company obsessed with making products thinner have just contradicted their own beliefs and marketing, and made their newly released product, thicker. However no one is asking why? If we 'Follow The Money', the corporations and people that run Apple from behind the scenes are desperate to convince the global population that being chipped through a form of RFID is a good idea, and are using Apple to push their banking agenda. In-order to deceive the public from realising this, the promotion of "Health and Fitness" is being used as the excuse to implement the needed programs and infrastructure in the background. This is why there is a massive media campaign currently to push implants, Pay Wave and Apple Pay platforms, as these same banking corporations control the media. We'll all be sure to keep our eyes out for the Illuminati. 1 millimeter thicker probably wouldn't turn me off from getting this, but the series 1 was all ready pretty thick. Almost everything else Apple makes thinner, except the one thing that I want to be thinner. Oh well, I guess the tech just isn't there yet. Maybe it's just me, but I can REALLY see the added thickness and it kind of breaks the design for me. The Apple Watch 1 was on the verge of being too thick, this one crossed it. I don't know what it is but the 1mm adds a lot to the curve and makes the whole device seem bigger and less elegant. Go back 3 years and let's see tech journalist design a smartwatch that best Apple's. Simplicity, fitness, swim-proof and elegant fashion-conscious design. That'll win the day. Throw in watchOS 3 and you're onto something really nice. Meanwhile ugly round so-called smart watches that look like they are from the 90's get high praises round here from the ultimate trend setting keyboard warriors.